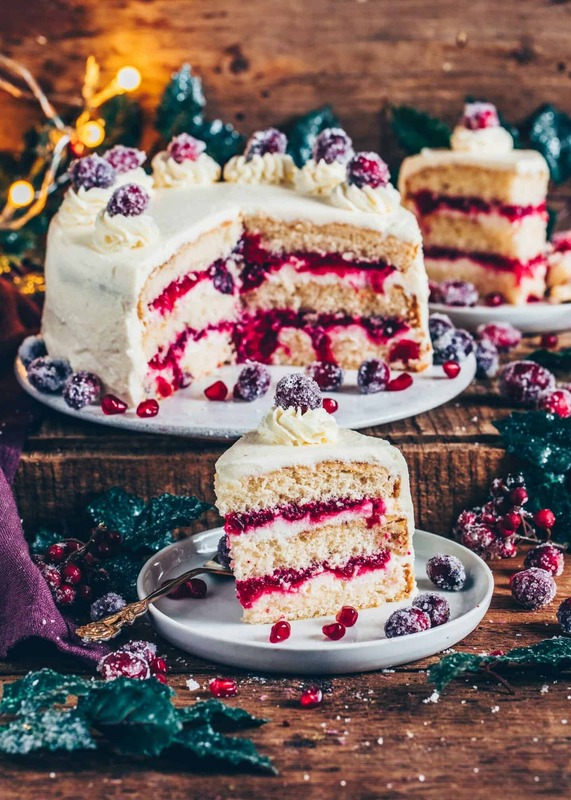 I came up with the idea of making a white Cranberry Cake because we usually bake our traditional Black Forest Cake on Christmas. For some reason, I had no cocoa powder on hand, so as a result, I spontaneously decided to make a white cake instead. 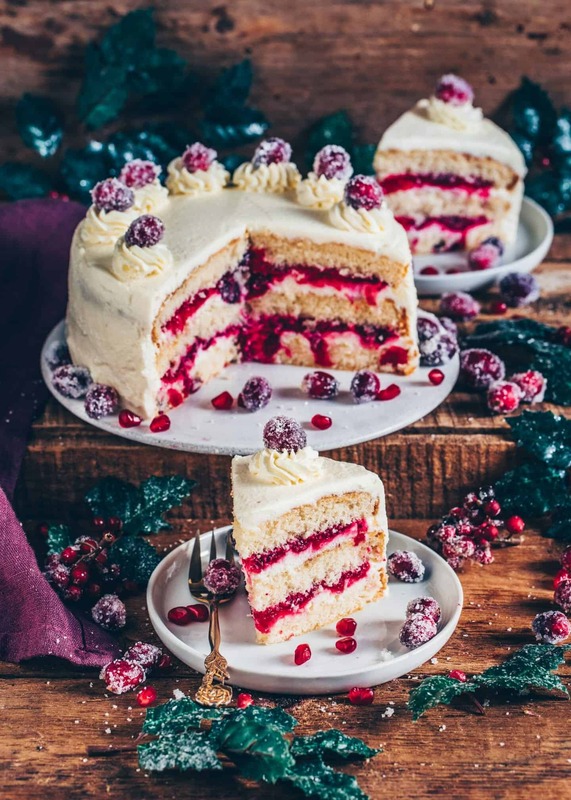 Since Cranberries are in season at the moment, I thought it would be a great addition to this fluffy Vegan Vanilla Cake. Well, I was right because it is! I mean, usually recipe ideas are much better when they happen by doing, rather than by planning before, right? 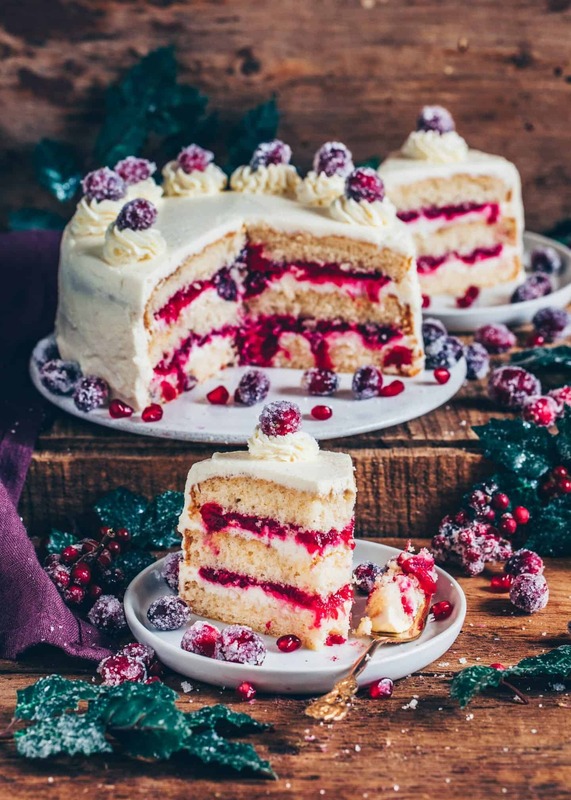 Even though this Vegan Cranberry Cake was not exactly what I wanted to make, the result was definitely a success. 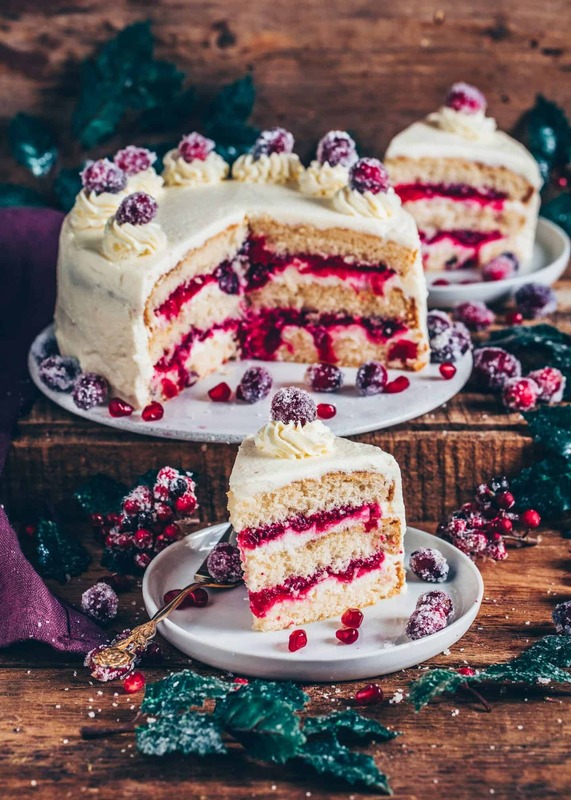 Essentially, it’s a festive take on my Cranberry Loaf but as a layer cake with whipped coconut cream frosting. Or, I could even say that it’s the white version of my Black Forest Cake? 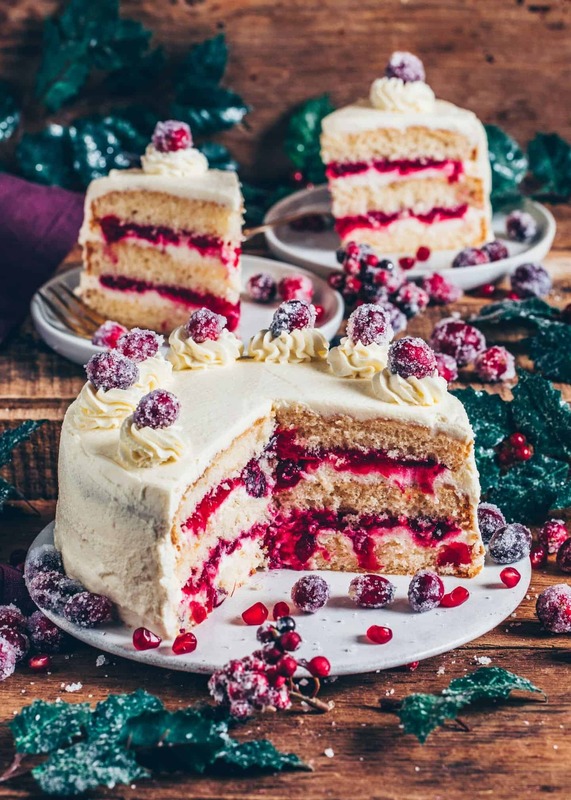 This Vegan Vanilla Cake is fairly easy to make. First, in one bowl simply combine all the wet ingredients. Second, in another bowl combine all the dry ingredients. Third, sift the dry ingredients over the wet ingredients and stir to combine. To make it more special, I also added some fresh Cranberries to the batter, but this is just an optional step. 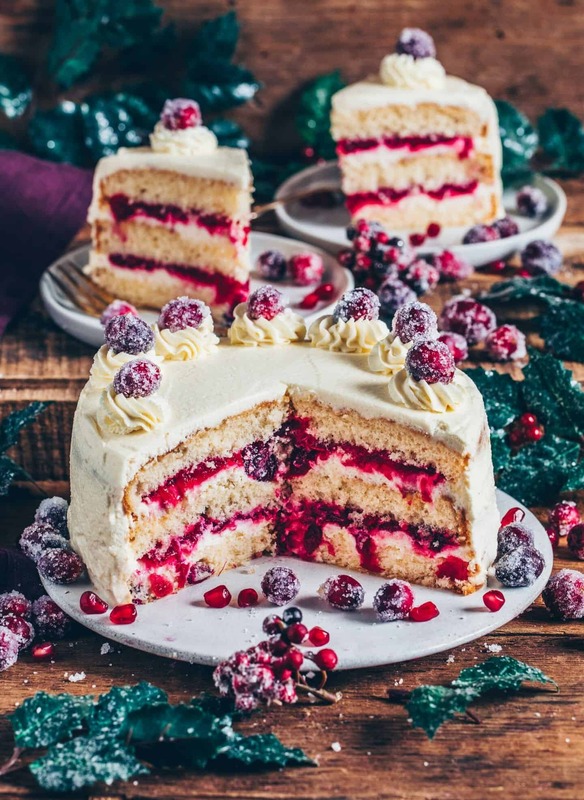 However, if you choose to add them too, I suggest tossing the fresh or thawed cranberries in a little bit of flour before folding them into the batter of this Cranberry Cake. Otherwise, they’ll probably sink to the bottom during baking. 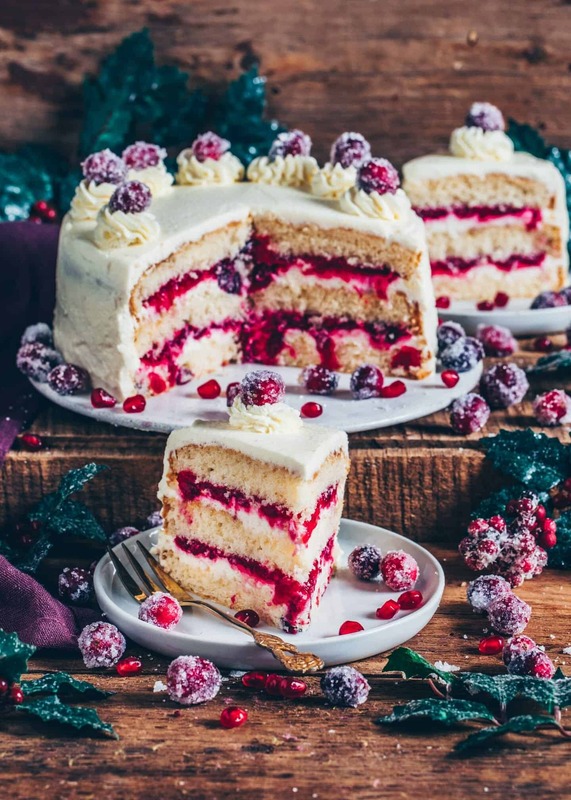 You can either bake this Vegan Vanilla Cake in three tins or bake it in one tin. If you decide to just use one, please make sure to double the baking time. Also, once the cake is cooled after baking, you have to cut it into three even layers. Anyways, this Vegan Vanilla Cake tastes amazing even when it’s not layered! 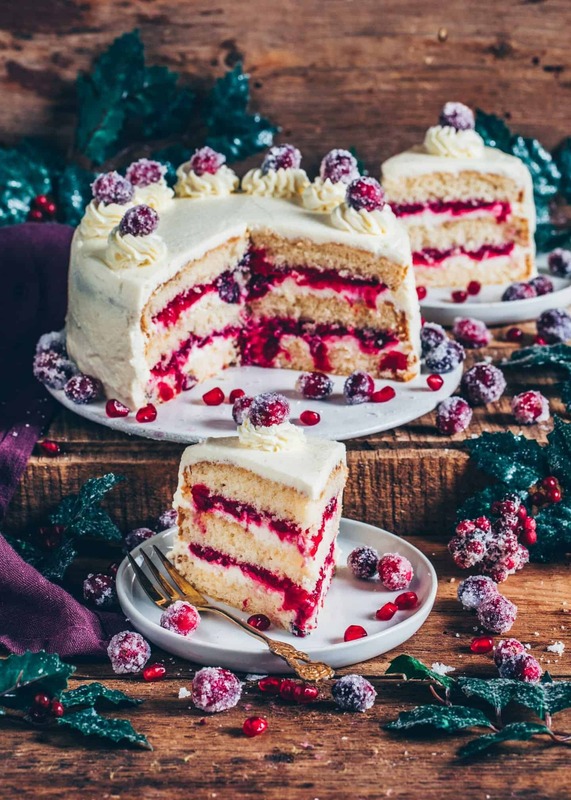 You can serve it as one regular classic Vegan Sponge Cake and add the frosting or any other toppings you like. 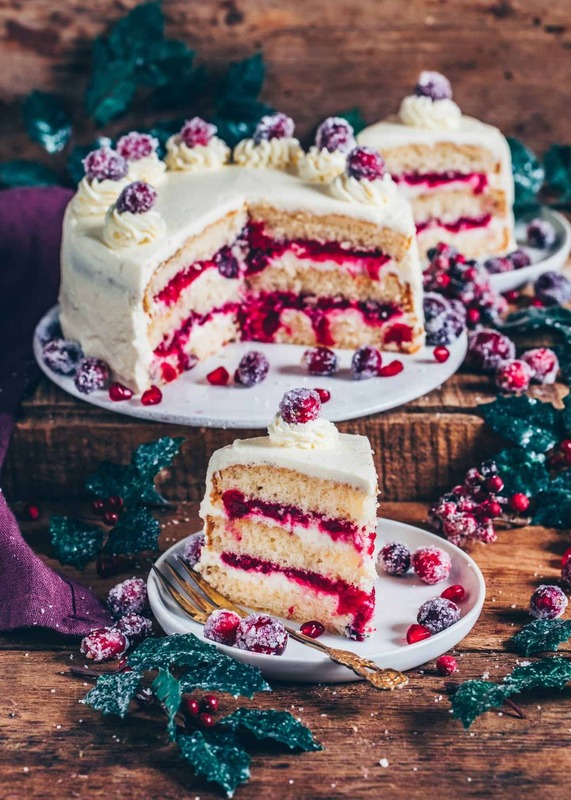 The Cranberry Compote definitely takes this Vegan Cranberry Cake to the next level. It’s a wonderful sweet and sour filling, which complements this Vegan Lemon Cake so perfectly. And did I mention that it takes only 3-5 minutes to make? Furthermore, the Cranberry Compote tastes delicious as a topping for Waffles, Pancakes, Crêpes or other sweets and desserts. Especially when you combine it with whipped coconut cream. It tastes absolutely amazing! In a measuring jar whisk together the soy milk and apple cider vinegar. Set aside to clabber for 5 minutes. Add oil, sugar, vanilla and lemon zest and stir to combine. In a small cup, stir cornstarch in 2-3 tbsp of the water to dissolve. In a pot, add Cranberries, remaining water, orange juice, and sugar and bring to a boil. Cook for about 3-5 minutes until the cranberries get soft, stirring constantly. Then mash with a potato masher or spoon. Stir in the cornstarch mixture, bring to a boil again, then remove from the heat and let cool. Add non-dairy cream, icing sugar, and cream stabilizer into a mixing bowl and beat using an electric hand mixer on high speed until whipped. Put one of the 3 sponge cakes on a serving plate. 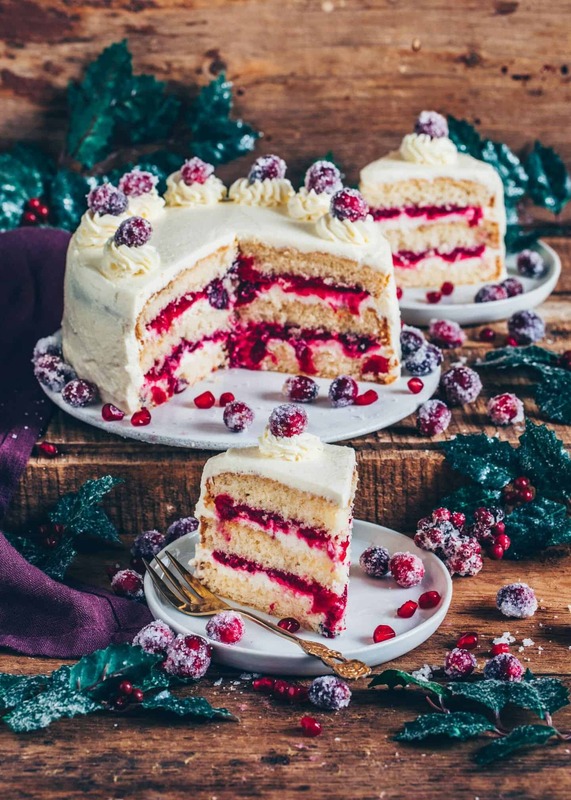 Spread the cream frosting in an even layer over the top of the sponge, then spread over cranberry compote. Put the next sponge on top and repeat this step. Then put the last sponge on top and spread remaining cream frosting all over the top and sides of the cake. (Optionally, save a small portion of the cream for the decoration and fill into a piping bag). 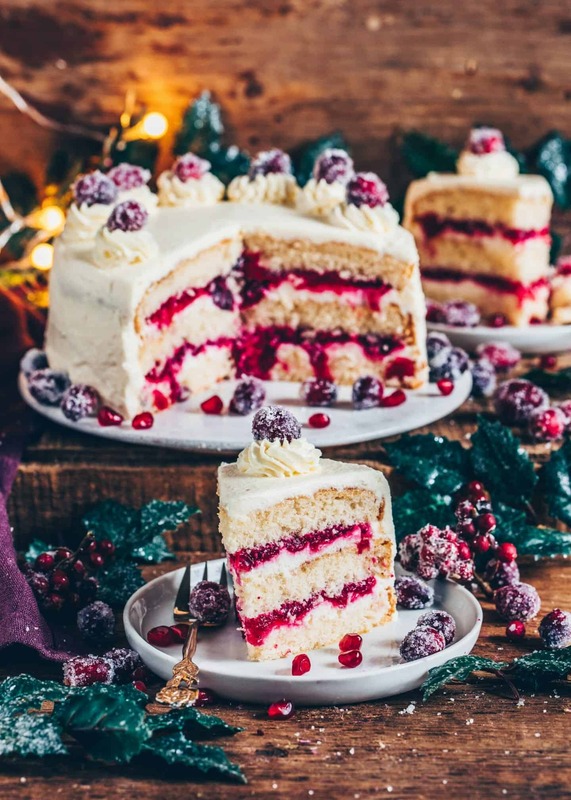 Make pipes on top of the cake and decorate with Sparkling Cranberries or other toppings. Instead of self-raising flour, you can also use all-purpose flour + 2 tsp baking powder. I use this plant-based cream for whipping because it gets perfectly stiff. If you want to coconut cream instead, refrigerate 2 cans of coconut milk overnight. Then scoop out cold coconut cream from the cans (you can store the excess liquid in your fridge for another use). Add cream into a cold bowl along with sugar (and cream stabilizer) and whip for about 3 min, until stiff peaks form. Make sure not to over-whip. 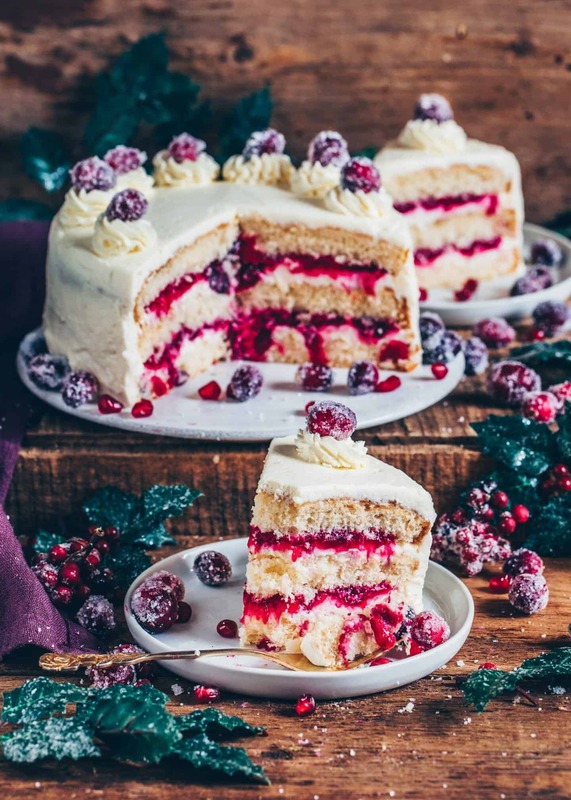 Your cranberry cake looks so fluffy and delicious. 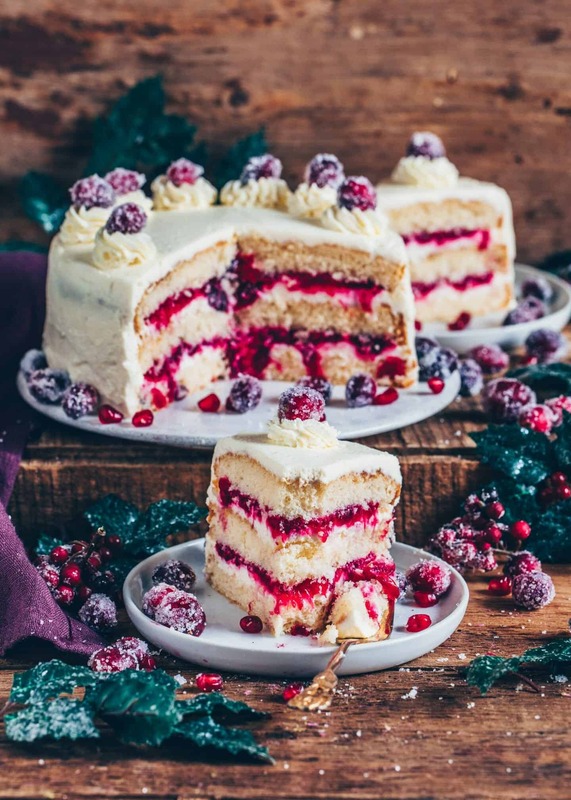 Love the cream frosting and compote, so pretty. Christmas so made the compote from this recipe to avoid wasting them. I have used the compote to top my morning porridge or chia pudding and it’s so lovely! The orange and cinnamon gently remind me of Christmas and was a lovely gently warming flavour! If I can find some more fresh cranberries before next Christmas I will be making it again! 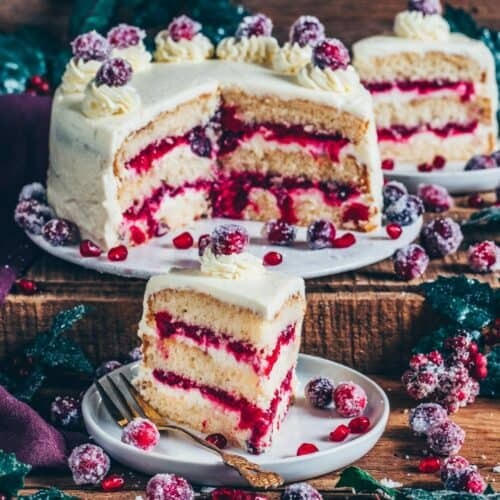 You can also make this recipe with other fruits if you like. Danke für die Antwort! Das Rezept sieht so toll aus. Du kannst die Menge einfach verdoppeln und auf 2 Formen verteilen. Bezüglich der Backzeit müsstest du dann mit einem Stäbchen testen. Ich schätze es sind ca. 50 Minuten.